Miranda has mentored and judged the IMAGINE IF! competition and accelerator programme in Cambridge for several years. We talk to her about being a mentor, the life sciences sector in Cambridge, and creating successful ventures. Innovation Forum Cambridge (IFC): Why have you committed yourself as a mentor? Miranda: The bio entrepreneurs the Innovation Forum attracts to IMAGINE IF! are impressive. They are bold, practical and ambitious to make the world a healthier place. They are working to solve important problems and bring fresh thinking with technology excellence and a magnetic ability to build communities of like-minded people. I am delighted that Sixfold Bioscience, which is developing drug delivery nanotools for cancer, has been selected for the global IMAGINE IF! finals. Sixfold was founded by three Postdocs and PhDs from the University of Cambridge and the Francis Crick Institute in London – an excellent example of collaboration for improving global health. IFC: How do you support start-ups in your role as mentor? Miranda: Much of my work as a mentor involves helping companies raise funds and build a sustainable business. The companies usually have a prototype and customers and are ready to go up the growth curve. People are often searching for the key application for their products and when they find the alignment, customers and funding flow. I support the companies joining up technology innovation with markets and investor needs. IFC: How has the science and technology innovation ecosystem evolved in the past five years? How will it continue to be successful in the future? Miranda: The quanta of funding companies in the Cambridge biocluster attracts has grown substantially over the last five years, be this for technologies to support life sciences research, the development of medicines and clinical care. Patient capital and more recently crowdfunding are backing life sciences innovation as well as corporate, private and venture capital investors. Genomic health is developing new treatments involving IT innovation, and with technology convergence, bringing new investors. As our understanding of human biology quickens, we will see more companies growing from tools providers to product businesses. We are more mindful now of the diverse needs of people around the globe and this is creating more people-centric business models in biotech and healthcare – and this will continue. IFC: Which three pieces of advice would you give to young science entrepreneurs to achieve success in the science and technology innovation ecosystem? Persistence to see you through! The IMAGINE IF! 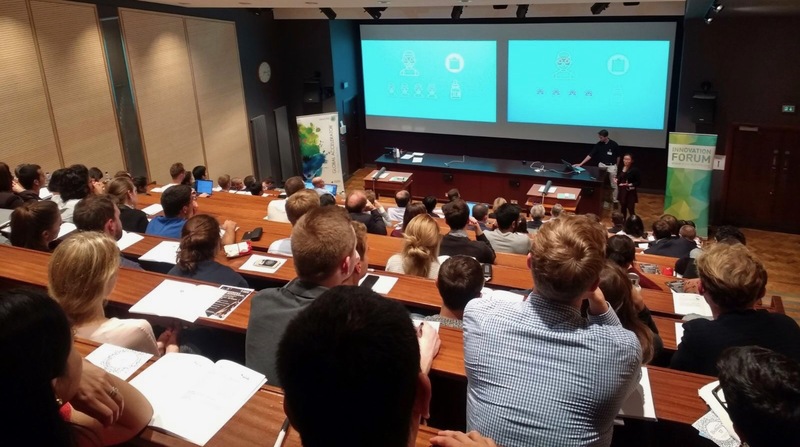 is the first truly global competition and accelerator programme for science ventures. Industries represented by IMAGINE IF! start-ups include life sciences, healthcare, digital health, clean tech and advanced engineering. The accelerator provides to early stage science start-ups extensive opportunities: mentorship, the potential to secure non-dilutive capital, free advice from leading professional companies and rapid networking across the Innovation Forum platform.